That’s a Lumia 900, BTW. Beyond Angry Birds and Facebook, it seems the next most-needed app (at least from what we can tell from users constantly asking us about it) is Skype video call functionality. While we don’t know why so many people couldn’t just get on their personal computers for it, it seems we’re doomed to always give consumers the yes/no answer when it comes to Skypinating on any new phone that we write about. 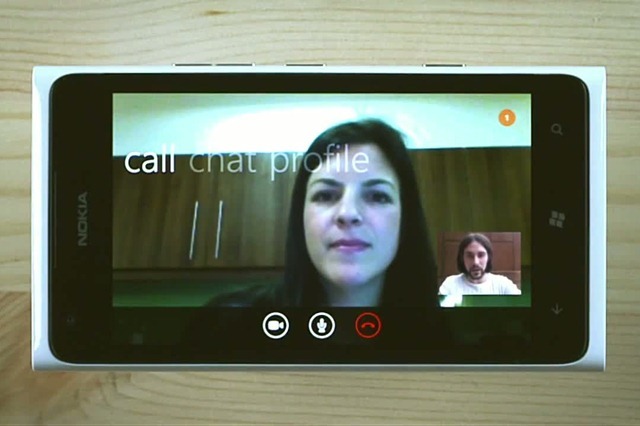 So here we go: Skype Beta (with video calling) is now available for a select number of Windows Phone 7 devices. Hooray! The app is currently in beta but should be downloadable with various types of handsets. It has, however, only been tested on a few phones thus far. And for those without front facing cameras (Nokia Lumia 800!!! ), you’re kinda screwed to only be chatting with your rear camera. Bummer. Link to download the app and a video teaser is after the jump. The Skype for Windows Phone 7 Beta app is available now in the WP7 marketplace and can be reached here, or alternatively you can scan the barcode below. The app has been tested with a few phones so far including the Nokia Lumia 710 (no front camera), Lumia 800 (no front camera), HTC Titan, Radar, Samsung Focus S and Focus Flash. Grab it now so you don’t have to answer yes/no Skype questions anymore either. Note: The Nokia Lumia 900 will have a front facing camera, so if you need Skype video calling and want the Nokia styling, wait for that one. We’ll be posting an article about it later.